OPPOSITION MDC leader Nelson Chamisa, who recently embarked on a regional diplomatic offensive to sound Sadc leaders on Zimbabwe’s worsening political and economic crisis, has pleaded with the bloc to heed his party’s distress call. “We feel that there has been an attempt on the part of Sadc, the chairperson of Sadc, the President of Namibia [Hage Heingob], to listen to one side. We feel that in order to have a perfect picture of what is happening in Zimbabwe, you must have a perspective from both sides. They must also listen to the MDC and not just Zanu PF,” he said. Chamisa said his party would continue to knock on the doors of African leaders and influential politicians to push the Zimbabwean agenda so that the political impasse is resolved. He was recently in Botswana, where he was lobbying influential political leaders in an effort to have Zimbabwe’s political and economic challenges placed on the Sadc agenda. In Gaborone, he reportedly met with senior government officials, ruling party members, former President Ian Khama and opposition leaders, where he apprised them on problems in Zimbabwe. 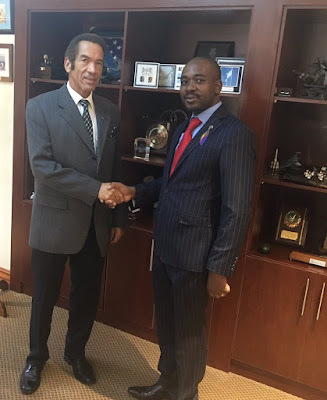 Chamisa said he used the Botswana trip to seek African solutions to the Zimbabwean problems. “Had a hugely enriching engagement with HE Ian Khama, the former President of the Republic of Botswana, so fulfilling to tap and drink from his well of wisdom, fixing African problems to make all African countries citadels of democracy and prosperity is key,” he said. Chamisa’s spokesperson Nkululeko Sibanda said his boss was firming his diplomatic offensive and would continue to knock on the doors of all influential African leaders to ensure that the problem in Zimbabwe does not degenerate into chaos. “President Chamisa is concerned about Zimbabwe, thus he is engaging in diplomacy on the African continent, as underpinned by essential ideas that Zimbabwe is part of a bigger African family, African counsel and support are fundamental,” Sibanda said. Chamisa has so far met with South African President Cyril Ramaphosa, and is looking forward to a meeting with Geingob, both believed to be sympathetic to President Emmerson Mnangagwa.